Click here to download a free excerpt from the book! Globetrotter's Pocket Doc is the only English international medical communication book for travelers to foreign countries. In the Globetrotter's Pocket Doc, vital medical facts regarding acute, major, and minor medical problems are provided in lay language with translations. 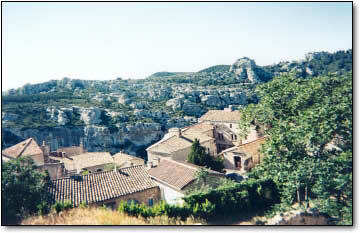 The book is currently available in	French, Spanish, and Italian editions. 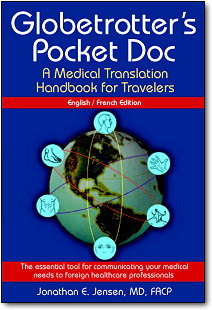 Globetrotter's Pocket Doc: A Medical Translation Handbook For Travelers, English/French Edition is an international, English-language, medical communication book written especially for travelers to foreign countries. It is not a standard book; instead, it features lists of medical conditions, illnesses, and injuries, in English and in French, that any English-speaking traveler can point to and immediately inform a French-speaking doctor his or her ailments. A superb communication tool, and an absolute must for travelers with chronic medical conditions. In addition to lists of symptoms, a quite lengthy bilingual assortment of prescription and non-prescription drug names, charts, scales, anatomic diagrams, medical history forms and more round out this first-rate communication tool that just might save a life. Caduceus International, LLC. All rights reserved.